The world faces a “perfect storm” of food, water and energy shortages. Food stocks are the lowest they’ve been in 50 years. John Beddington, chief scientific advisor to the UK Government, has stated that 50% more food, 50% more energy and 30% more water will be needed by 2030 to supply a growing population. Even in developed nations like Britain and Australia, rising environmental pressure on crops would drive up import prices. Higher temperatures and less water brought about by climate change is expected to make some crop growing area difficult to manage, particularly in areas which are already experiencing drier than normal conditions. However, the precise impacts of climate change are difficult to predict accurately. risk of leakage. The burial of biochar into the soil in conjunction with bioenergy production (gasification) could potentially meet these criteria. For large scale sequestration efforts, biochar production could potentially divert previous cropland to biomass production. In this instance, other forms of soil carbon amendments could provide a solution for soil management and GHG sequestration. Due to its high aromatic carbon content, biochar is believed to be highly inert in soil. In reality, most biochar is slow to degrade in soil but the extent of microbiotic oxidation depends on pyrolysis condition (heating length and temperature). The current view of sustainable agriculture in the UK focuses on improving the rural economy as a means of improving environmental resilience in agriculture. It treats the environmental problems associated with agriculture as symptoms of a dysfunctional system. The seminal Curry report (2002) sets the scene for the development of British agricultural reform. It identifies the necessary changes for sustainability. The report helped change the view of soil from inert substance which must be injected with useful nutrients for crop growth to a living entity which must be cared for like other crops. Increasingly, commercial farming is being viewed in an ecosystems way where each individual part contributes to the whole farm health, including the living soil. Biochar can help improve a range of living and inert soil conditions. Adding carbonaceous amendments to soil could enable a more efficient soil ecosystem by enabling the use of organic reducing GHG emissions from the soil with potential carbon mitigation, improving soil, improving soil physicochemical properties and improving fertiliser use efficiency. Typically, biochar has been produced on a small scale using traditional charcoal kiln methods. Building kilns is simple and enables on-site biochar production from waste such as wheat chaff or straw. Kiln use is widespread in developing countries. However, it is difficult to control burning conditions in a kiln and any large scale production is limited. A purpose-built gasification combined heat and power (CHP) plant designed to deliver energy to the campus which has over 10,000 staff and students. Such a plant has been built at the University of East Anglia but barriers to the use of it’s biochar has been substantial. The UK Environment Agency views the biochar as a waste and. 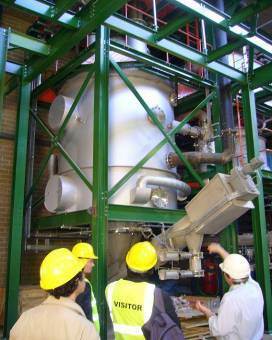 Under EU legislation, the CHP plant produces energy and biochar is a waste. Therefore any field trial must comply with waste protocols Waste must not be buried without specially permission or the appropriate tests to ensure its safety. Obviously, we need to burry biochar to carry out these experiments in the first place. A dedicated team of researchers at the UEA have been trying to solve this barrier to field trials for nearly a year with moderate progress. The UEA wish to carry out field trials and to do so, must show the EU that the biochar is reasonably safe to apply in the open environment. Therefore, experiments must show within reason, that biochar incorporation up to the proposed incorporation rate of 10t/ha will not 1)adversely leach toxic chemicals into the open environment; 2)inhibit plant growth; 3)cause increased GHG emissions; 4)negatively impact soil physical, chemical and biological health. We carry on working diligently but for now, it appears that only bespoke biochar will fit the bill.